Last week a colleague at work, who lives in one of the prettier areas of rural Virginia, brought a dozen duck eggs to work. She had purchased them from a local farmer. Several of us pounced on these exotic avian gifts, since most of us obtain eggs from the lowly chicken from local grocers. Curiosity prompted me to compare the duck eggs to the two varieties of chicken eggs in my refrigerator. I only purchase large brown organic, cage-free chicken eggs. In the U.S. egg categories do not necessarily hold true, however. Both the eggs in the center and to the left of center are sold as large eggs. The definition of large seems not to be standard. However, capitalism is alive and well in the Commonwealth. A dozen eggs on the left sell for $3.99 USD for a dozen, whereas the middle eggs sells for $6.99 USD per carton. The differences in their sizes are astounding. The duck egg on the right is huge by comparison. The duck egg made me think of Jane Austen, her mother and her sister. We know that the three women struggled for a number of years after Reverend Austen’s death, moving from house to house, city to city, before settling in Chawton Cottage. As the rector’s wife in Steventon Cottage, during Jane’s childhood, she oversaw a poultry yard with ducks, turkeys, chicken, guinea fowls. The move from city life to Chawton Cottage provided the Austen women with access to a substantial garden once more. Image of the garden at Chawton Cottage by Tony Grant. Studying my duck egg, I wondered how similar it was to the kind Mrs. Austen (or her maid of all work) would have gathered. Apparently, Aylesbury ducks were popular in the UK during the late 18th through 19th centuries. These free ranging ducks ate grubs and any protein of interest, giving their meat and eggs a unique, strong flavor. Aylesbury ducks figured prominently in Beatrix Potter drawings. Image from Wikimedia Commons. My duck egg tasted delicious – not much different from my free-ranging chicken egg, except that one egg took the place of two! I looked at some of my favorite 18th century cookbooks to see how duck eggs were used in recipes. The recipe below is typical of the era, in that few or no measurements were provided. One could assume is that “egg” is the food that the cook happened to have on hand, be it pigeon, quail, grouse, chicken, or duck!! I have one duck egg left and intend to fry it as round as balls! Having a deep frying-pan, and three pints of clarified butter, heat it as hot as for frit­ters, and stir it with a stick, till it runs round like a whirlpool; then break an egg into the middle, and turn it round with your stick, till it be as hard a poached egg; the whirl­ing round of the butter will make it as round as a ball, then take it up with a slice, and put it in a dish before the fire; they will keep hot half an hour, and yet be soft; so you may do as many as you please. You may poach them in boiling water in the same manner. Duck egg recipes from Great British Chefs. Perhaps I should try boiled egg and soldiers! Jane Austen and the Georgian city of Bath are closely entwined throughout her novels and later life. Tony Grant’s contributions regarding Bath have been vitally important to me and this blog. His thoughts, images, and insights have enhanced my posts about this topic. 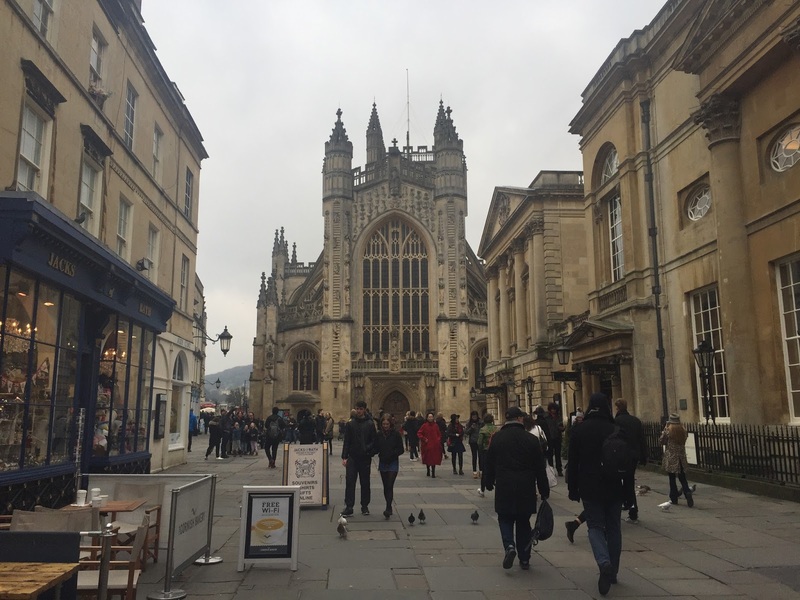 Tony has generously allowed me to link to his popular February post about his latest visit to Bath with his wife Marilyn on his blog, London Calling. One third of the way through his post, I linked to his site, so expect to be taken to another blog. At the end of this post, I added links to other Jane Austen’s World posts regarding Jane in Bath with Tony’s photographic contributions. Enjoy!! Thank you, Tony, for your continued support. Sometimes, among all the unwanted adverts, links and promotions that crop up on my i-phone, there is something of use. Recently Marilyn saw a one night deal advertised at The Royal Hotel Bath. That is not the Royal Crescent Hotel at the top of the city by the way. The Royal Crescent Hotel provides, I am sure, extreme luxury. Well, it should do. The cost of a suite for one night is £1000. 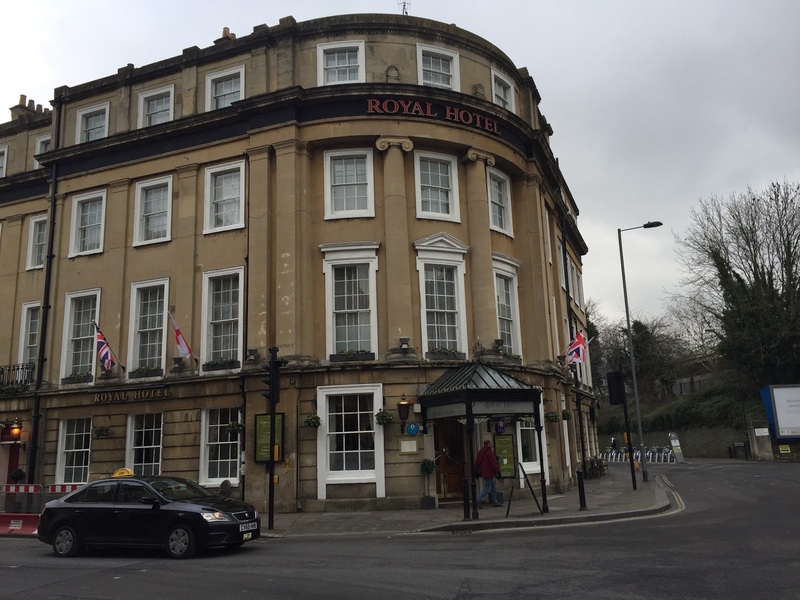 The Royal Hotel is the sturdy building, designed by Isambard Kingdom Brunel and built in 1864, next to the main railway station located next to the River Avon. The deal was excellent. The hotel is three star but it offered a very comfortable experience. For £125 we had a well appointed double room with en-suite facilities. When we arrived we had a cream tea in the foyer. The evening three course meal began with a complimentary glass of champagne. The deal also included a full English breakfast. The weather was cold but clear skied while we were in Bath. We had to wrap up warmly. We have been to Bath on a few occasions and we have seen the main sites before. This time we once again visited Bath Abbey and for the first time visited the Roman Baths complex. There was quite a queue to get into the Pump Room for afternoon tea so we decided to miss that. We have been to the Pump Room twice before. We found another coffee shop nearby in the Abbey precinct. Bath Abbey with The Pump Room on the right. Of course we walked past and along many of the sites in Bath that are connected with Jane Austen.When we arrived in Bath, we first of all parked in our usual car park, near the river, very close to Green Park buildings, and the house where The Reverend George Austen died on Tuesday 21st January 1805, Jane wrote to her brother Frank Austen, stationed on HMS Leopard in Portsmouth..
After booking into The Royal Hotel we moved our car to the car park in Manvers Street next to the hotel. I discovered that Fanny Burney , the playwright and novelist, a contemporary of Jane Austen’s, lived in South Parade, next to the car park. Edgar Buildings are located in George Street. We turned left along George Street to Gay Street and walked up the hill to The Circus, past number 25 Gay Street, a house the Austens stayed in after the Reverend Austen’s death. From, The Circus ,we walked along Bennett Street to The Upper Assembly Rooms . Vic’s tribute to Jane Austen in the corner of her living room: a facsimile of Jane’s chair and writing table. This blog has lain idle for a little over a year, but I plan to resurrect it. For the time being, I’ll add one or two posts per month until I am able to devote more time to my favorite author again. I am pleased to announce that this year’s first post (by Rachel Dodge on Regency manners and greetings) will be published tomorrow. I am also in the process of updating the links in the pages that sit on top of the blog. These updates should be completed by mid-summer.